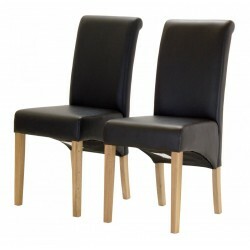 Two Black Faux Leather Dining Chairs with Solid Light Oak Wooden legs. Two Black Faux Leather Dining Chairs with Light Oak Wooden legs.Height 93cm x Width 44cm x Dept..
Two Black Faux Leather Dining Chairs with Light Oak Wooden legs.Height 102cm x Width 44cm x Dep..
Two Black Faux Leather Dining Chairs with Solid Light Oak Wooden legs.Height 99cm x Width 49cm .. The parkfield Chair is a simply designed yet beautiful piece of furniture.Manufactured with..